On the 7th Tristan (374g) and Issy (335g) were caught up in the shut off and moved to SF2 for the breeding season. We also took blood and faecal samples to contribute to our ongoing bird atoxoplasmosis study. The samples are being analysed in Prague for a PhD project so we do not expect immediate results. In the process of the catch-up we also trapped B6978 so we weighed her (290g) and noticed that her overgrown beak and broken off naturally. On the 8th Arthur (355g) was caught up, had samples taken for atoxo testing, and moved to SF3. The next day his partner Gwinny (276g) was moved down. She too had samples taken for atoxo testing. The nest box cameras were switched on by the 9th then went ‘live’ on the Durrell network by the 14th. Aside from the weekend in the middle, there was an administrator hitch involving user licenses, which caused the delay. Since then we have been viewing the cameras when in the office. 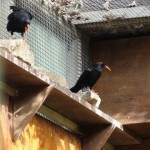 We have had a few glitches with the choughs and the cameras as we suspected based on their behaviour last year. 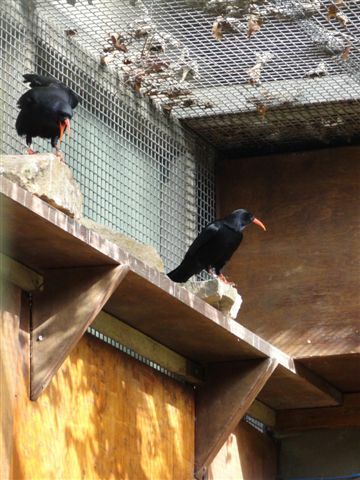 We know they are prone to playing with them so tried our best to secure the cameras before the birds went in the aviaries. The nest boxes and cameras were fitted in the aviary but after that point it wasn’t feasible to fiddle around too much, so we tried duct taping the cable to the box and then the camera to stop it tilting. However, this just encouraged Tristan and Issy in SF2 who pulled the tape off and moved the camera. 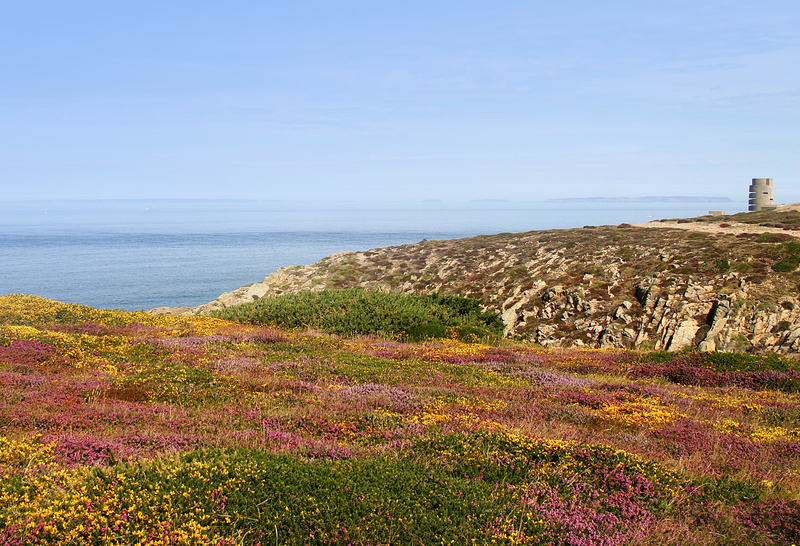 We have only had to interfere twice with re-positioning the cameras within the first week. They have moved it since, but we can still see most of the floor, so have not bothered disturbing them further. Because we expected to be able to playback recorded footage we have not taken detailed notes of nest building. Especially at the start when it took both pairs a considerable amount of time to figure out how to build a nest. 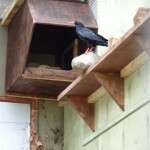 We added nesting material in the stages recommended byParadisePark, i.e. large twigs then smaller bits such as heather, then finally wool or horse hair. What we do know is that in SF3 one bird would take in a twig whilst the other would take it out. This went on for well over a week. Next door had similar issues although to a lesser degree. SF3 had the basic structure of a nest before SF2 started laying foundations, but then they quickly caught up. A potential problem we have in SF3 is that one of the birds, we think the female, has a habit of vigorously pecking at the inspection hatch on the side of the box. We thought that she did it whenever she sensed the choughs next door in their box. However, we have observed this behaviour when the nest is vacant. We have still been having issue with mice in the catch-up cage so we stopped feeding in there and had another go trapping. However, Yl-R had somehow managed to get inside the closed shut-off. The only possible way was under the frame behind the rocks. She must have been very determined. Fortunately, for her, all the traps had been triggered by mice. 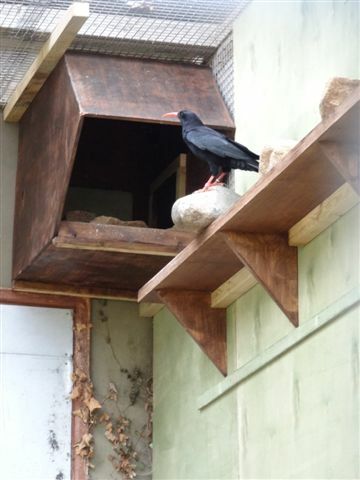 We have stopped trapping now and will continue looking at ways to improve pest proofing in the aviary. The toad spawn failed so the pond was cleaned out for the choughs to use again. A few hours later a newt was swimming around in it. As of March we have been adding grated cuttlefish to the chough diets to ensure they have enough calcium in their diet for egg production.